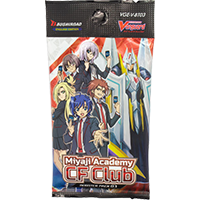 "Miyaji Academy Cardfight Club" is the 3rd V-icon Booster Set released in the Japanese and English formats. The set includes 84 cards (5 VR, 8 RRR, 12 RR, 17 R and 42 C) + 13 Parallel cards (5 SVR, 6 OR and 2 IMR) + 1 special reprint + 5 SCR cards + 3 Rubber Playmat Present Campaign entry cards (JP only). Each display includes 1 or 2 VRs. The enclosure rate for SCRs is different to previous boosters. Includes support for the Royal Paladin, Oracle Think Tank, Gold Paladin, Nubatama, and Narukami clans. Each display includes 16 packs. Each pack includes 7 cards, two of them being R or greater.